Noise Reduction is one of the biggest complaints we hear about in the building industry. Low levels are vital for human health and well-being. If the space you occupy is being infiltrated by outside noise, you will find it difficult to sleep or concentrate on the TV, the computer or your own conversation. For this reason we are seeing more and more people looking into cork and its acoustic properties. To use cork, or any acoustic material, properly you need to understand some of the basics about noise reduction in a space. There are several ways noise can enter your space. Each point of entry can be dealt with but it takes a bit of effort to investigate the noise. Direct Sound Transmission: This is when one object strikes another and produces a sound. Like footsteps or dropping a pot on the floor. Banging a nail with a hammer is another example of Direct Sound Transmission. Footstep noise is common in multifamily units which is where most noise reduction complaints originate. Eliminating footstep noise is more difficult than most people imagine. One of the few products that effectively eliminate footsteps is carpet. Carpet is considered a dirty, or allergen riddled product that is actively being removed from many homes and condominiums. Replacing this soft product with a solid surface or hard surface is creating plenty of tension in the condo world. Flanking Transmission is when noise causes parts of the building to vibrate and that vibration sneaks around joists or studs to enter another space. You could say the noise “outflanks” the building’s structure to end up in another space. Like a soldier getting behind enemy lines, Flanking Transmission is all about moving around structures and ending up somewhere else. The quintessential Flanking Transmission is through air vents or through plumbing pipes. The noise could be from direct transmission (hammering a wall) or from airborne sound (people talking). This type of transmission is devilishly difficult to find and to correct. Thousands of dollars can be spent on acoustic insulation only to have Flanking Transmission continue to occur. Overhearing: This is most common when noise makes it into your space through an opening such as an open window, an open door or an open-air experience (having dinner on a restaurant patio). Leakage: Leakage Transmission is when noise squeezes underneath things (air transmission) like under doorways or through the dead air between the drywall and the subfloor. A door that is left ajar the sound that escapes from one room to another is Leakage sound. This leakage is relatively easy to deal with because it only requires that you look for the “gaps” and then fill the “gaps” with acoustic spray foam. It is common to see acoustic spray-foam applications between drywall and floating floor installations. The foam stops Leakage Transmission from disrupting the room next door. Sound proofing a room is very difficult (it can be done but the money and the effort are so huge that it is easier to write about it as if it was impossible), but reducing the pathways sound can move from one space to another is a little easier. Up-down sound transmission from one space to another (Direct Sound Transmission) can be dealt with in three ways. You can upgrade the flooring and underlay (that includes upgrading or thickening the subfloor), upgrading the under pad (includes soft underlayment that runs under hard flooring like cork or rubber underlay) or upgrading the flooring to a sound-reducing form of flooring (carpet, cork or rubber). Carpet is most effective for “foot falls” but it falls short with airborne noise (conversations, TV, home stereo, etc). Solid flooring options require excessive under pads with exceptional sound qualities. This makes the under pad as expensive as the flooring itself. Cork flooring can offer most of the qualities of carpet with the benefit of a solid floor. Cork underlay/under pad is one of the most cost effective forms of flooring insulation on the market. 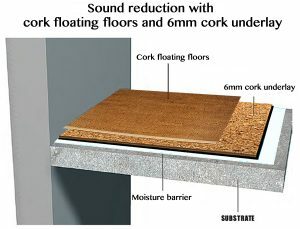 A cork floating floor installed over top of cork under pad offers an “acoustic insulated floor”. We’ve our ½”. 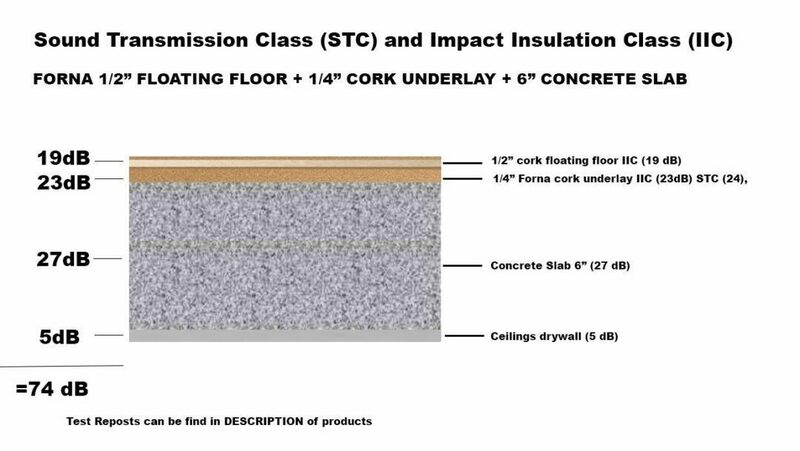 ¼” and 1/8” cork underlayment offer a reduction of 48 dB, 23dB, 13dB, and 10mm and ½” floating cork flooring offer a reduction of 16dB and 19dB. Our ½” cork floating floor/½”. ¼” and 1/8” underlay combination offer a reduction of 67 dB, 43 dB and 22 dB. Considering that a “good” floor/underlay combo will offer 14 dB, our combination offers excellent value for over price of product. Insulating flooring is easy enough, but what happens when walls are the problem. There are plenty of expensive solutions for this. The problem comes in when “expensive” is not an option. Cheap solutions rarely work and cost more because they have to be added to. The direct approach is the best approach. Retrofitting a Wall with Acoustic Insulation can be done but it takes appropriate materials with the appropriate technique. Cutting corners makes this project a useless upgrade. If you cut corners on acoustic insulation you will lose the benefit you were trying to achieve. That means you get to pay for it all over again. Acoustic 5/8” drywall is readily available on the market. It can cost as much as $3.24/sf. This is triple the price of regular drywall which makes many people shy away from it. The benefits of 5/8” acoustic drywall adds 18 dB of acoustic insulation. This requires adding another sheet onto the existing wall. The screws require acoustic anchors together with acoustic foam/putty prior to painting…but again this all part of the acoustic insulation experience. No cutting corners remember? To point out what acoustic 5/8” drywall offers, keep in mind any material that can offer 14 dB or more is WELL WORTH the effort and the expense. Compare that to regular drywall (5/8”) that offers (roughly) 5 dB of insulation and you quickly understand why the acoustic drywall is worth the money. The next option is Green Glue acoustic liquid sandwiched between 2 regular sheets of drywall. Green Glue is NOT an adhesive. It is an additive. Drywall screws + acoustic anchors + acoustic putty are still needed for this installation (again…no point in cutting corners). Green Glue requires 2 tubes per sheet of drywall for maximum effect. It will offer the same benefits as acoustic drywall but at a lower cost. Regular drywall is used which helps noise reduction the overall costs of the project. The benefits to Green Glue are seen after 7 days. Maximum benefits are realized after 30 days. This means it is harder to ascertain if the installation was a complete success. If time is of the essence, then acoustic drywall (with proper installation) will offer immediate relief. If budget is a concern then Green Glue will offer a slight advantage. If you are looking for a creative way to deal with sound while maintaining your design features of your home, then cork is always an option. 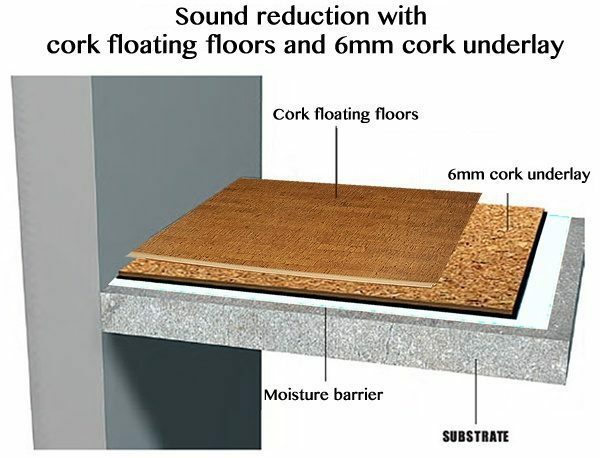 Tests have shown that 4mm cork glue down flooring tiles (can be used on walls, ceilings and floors) will offer 14 dB worth of acoustic insulation. A 6mm cork tile offers (roughly) 18 dB worth of noise control and noise reduction and 8mm cork tiles are said to be 21-22 dB worth of sound control and noise reduction. Considering that a basic 4mm cork tile is offered for $1.59/sf by Cancork Floor or iCork Floor it is easy to understand why cork is becoming an acoustic design favourite. Several 6mm cork tiles can be purchased for $2.79/sf. This still offers a price benefit to the acoustic drywall or Green Glue + regular drywall. The 8mm cork tile can be had for as little as $3.49/sf. The 8mm cork tile will offer a snick more acoustic isolation for roughly the same price as the acoustic drywall or Green Glue options.